In a mortgage loan, your mortgage interest rates tend to be lower than any form of borrowing. This is because mortgages are secured with a collateral, which is commonly a house or a property. That is why you need to keep up with your repayments to avoid losing your home or property. Mortgages are usually long-term loans and are paid on a monthly basis. 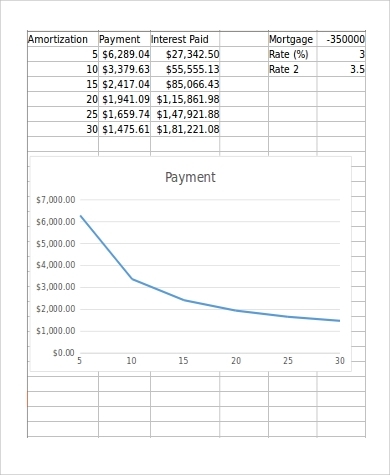 Using these mortgage amortization Excel samples and Sample Schedule can help you better understand mortgage amortization. Go ahead and browse through the samples we have provided for you below and find the sample that best fit your needs. Property – It is the residence that is being financed. Mortgage – A loan that is secured by a collateral, such as a house or any property and is paid monthly with its corresponding interest. Lender – An entity or institution that lends the funds to the borrowers. They are usually banks, business society, lending institutions, and credit unions. Borrower – They are those who lend money from lenders to finance the house or property that they want to buy. Principal – The original amount that the borrower wants to borrow. 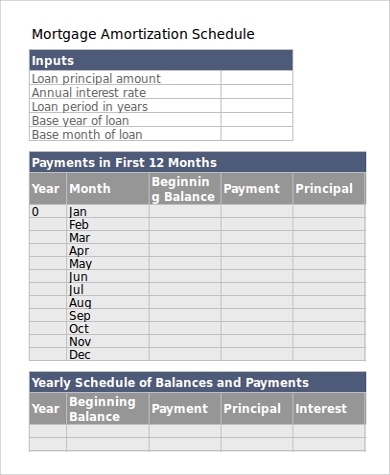 Interest – This is a charge or fee added by financial institutions for lending the borrowers some money. Repossession/Foreclosure – This happens if the borrower fails to keep up with the repayment of the mortgage loan. The lender is allowed to repossess or foreclose the the property being put on collateral as they see fit. This makes a mortgage loan distinct from all the other loans. 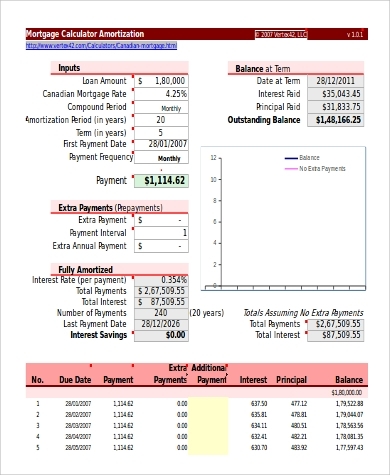 Completion – This is just the start of the mortgage. The completion is actually the legal completion of the mortgage deed. Redemption/ Repayment – When the last outstanding amount is paid, it is called redemption. This is usually the case after the end of the scheduled term. 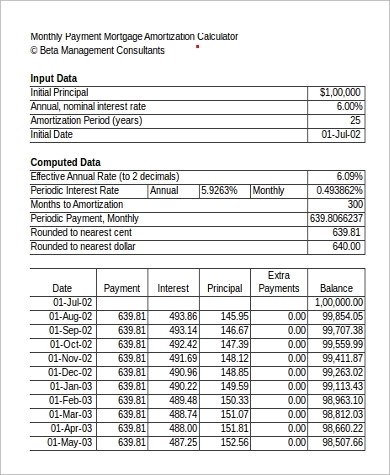 Our Amortization Table Excel Samples and Loan Amortization Schedule Excel Samples are also available for your perusal or for download. The most common property that can be mortgaged is a real estate property, but any legally owned property can be mortgaged. Others things that can be mortgaged are personal properties like cars, jewelries, appliances, etc. It is also known as a chattel mortgage. With this mortgage, the borrower can take their possession back anytime by following a certain procedure. On top of your mortgage interest rate are other fees that you need to look out for because these fees can be hefty. 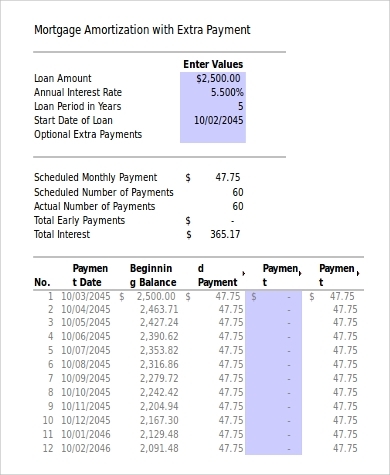 When you take out a new mortgage, there will be setup costs that vary significantly. If you need to get out of your mortgage deal before the scheduled end, you also need to watch out for penalty fees. The need for purchasing a property has recently boomed. Real estate companies are now offering a wide range of properties. You can buy your own property with mortgage loans. A lot of lending institutions including banks and credit unions offer mortgages, so taking advantage of it is not so hard to find. 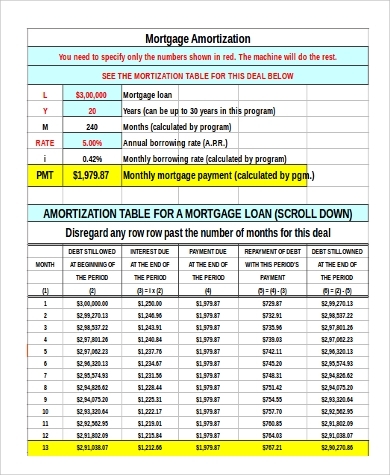 And to better help you with choosing the mortgage type that suits you best, our mortgage amortization Excel samples together with our Excel Amortization Schedule Samples are up for grabs online. They are easy to use and since they come in Excel format, you are sure to get organized. So don’t leave without downloading.